This afternoon I hit a wall creatively. So thought I'd try working outside for a change o' scenery. Was really nice. Not QUITE warm enough out yet though. Was generaly gorgeous out, and the sun felt greaaat and I enjoyed the squirrels cussing and being funny in the trees. Sitting in the grass was wonderful. But then every so often a cloud would cover the sun and the wind would pickup with its chilly chill. Ended up gettin pretty chilled but wanted to finishe the pencils before going back inside.. traditional pencilz for the win. Might have to use the markerpad I drew this on more often. 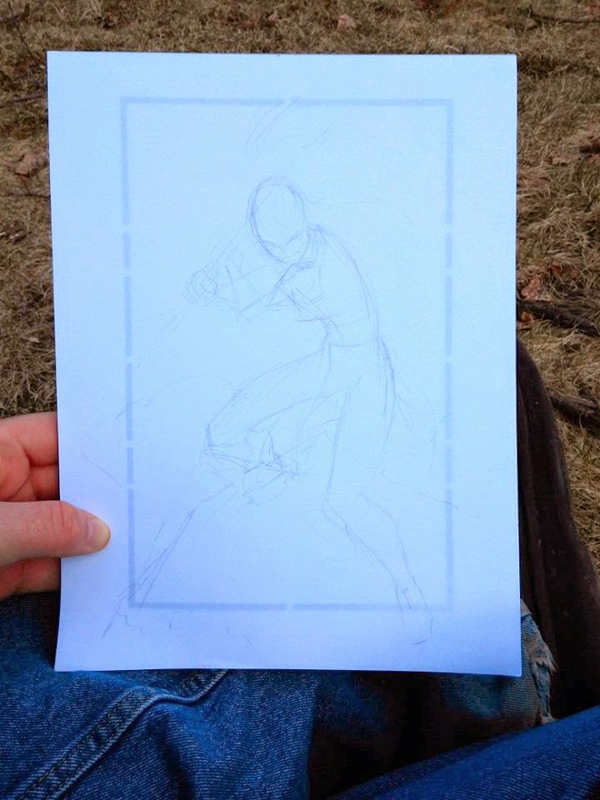 Great penciling surface and see through enough i can have digital sketches templates etc printed out and under it. This waas a comic page template i used as a general framing guide.